British Soldier: Claiming Games Cause Violence Is "Nonsense"
A man who knows real violence knows that games are not the cause. Andy McNab is the pseudonym used by an ex-SAS soldier on non-fiction books about his career such as Brave Two Zero, as well as military novels using his knowledge of real battlefields. 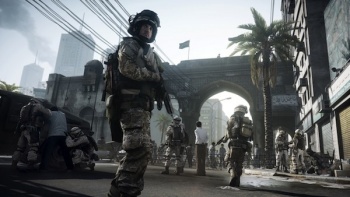 He was approached by EA DICE to offer his expertise on Battlefield 3 from the ground up, not just as promotional blather. Still, as part of his promotional blather role, McNab said some very interesting things regarding games and violence, how actual soldiers speak to each other, and where he thinks the next real-world conflict will erupt. "People have always been fascinated by war - games are just another medium for that," McNab told the Guardian. "There have been war films since the beginning of cinema - you could go along to the Saturday morning pictures and watch John Wayne kill 100 Japanese soldiers in 10 minutes. It's all part of the same thing. "And the big arguments about games inducing violence - they're a load of nonsense; violence has always been there," he continued. "And possibly, the reason the crime rate is declining in the US is that people are now staying in and exploring violence through games rather than going out and beating people up." One of the major things McNab contributed to Battlefield 3 was to help the writing feel authentic. "My first job was helping with the writing, coming up with plausible bridges between missions, doing some of the dialogue. Military speak is very progressive and positive. No one says, 'Well, we'll try to get to X by 9am,' it's all about 'you will do this, I will do that, this will happen.'" Why does the change of tense matter? "The point of that is: if you start with a moment of doubt, when things get worse, doubt becomes failure. It's got to be positive from the start. And it's all about brevity - military language is not as formal as we think it is," he said. With the defeat of Kaddafi in Libya and the U.S. pulling out of IRaq and Afghanistan in the near future, McNab made some cautious prediction of where the next problem area will erupt. "Tt's about assessing the future character of conflict. What all military forces do is assess energy and food security and the routes to and from trade partners. Food and water, we're all right on, so it'll be energy and trade routes - conflicts on the east and west coasts of Africa, possibly. The Americans, I think, still have an aircraft carrier fleet off the west coast protecting that flank. Our energy out of north Africa seems pretty secure now, it's the east and west coast that might be problem."